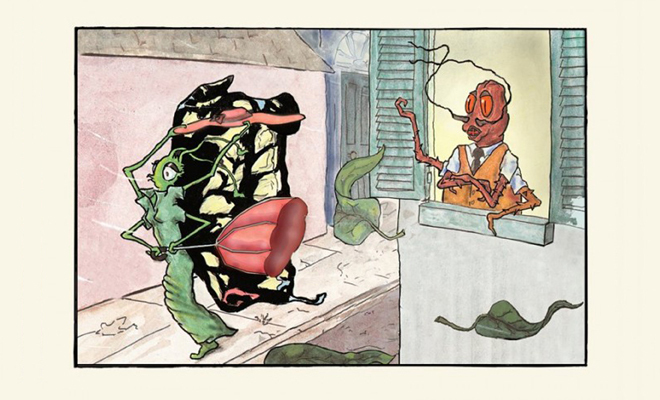 “THE FROG AND THE LIZARD,” ONE OF MORRIS’ FAVORITE TALES IN DALT WONK’S FRENCH QUARTER FABLES. Pelican Bomb continues our ode to summer reading with Benjamin Morris on Dalt Wonk’s French Quarter Fables. Despite the many mistakes committed by their characters, the fables’ poetic form lends the desired air of whimsy that prevents any one reading from taking them too seriously. With only a few minor exceptions, Wonk pairs his representatives from the animal kingdom nicely, and sketches them both in words and images in such a way as to reveal the full range of their emotions. 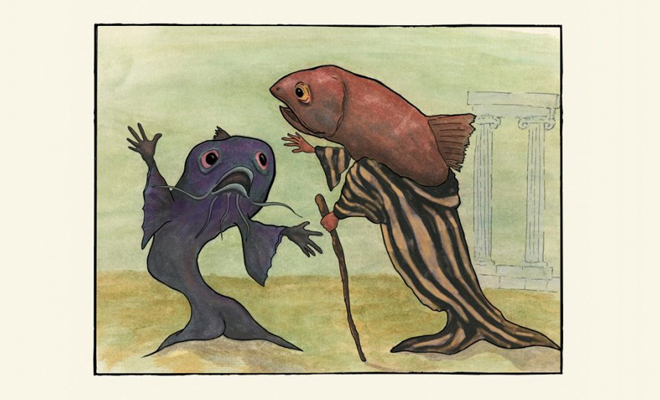 Among the best are “The Minnow and the Pike,” a jibe at the hubris of a bloodthirsty king (the pike, a thinly-disguised Louis XIV), or “The Hippo and the Egret,” a satisfying tale of just desserts. 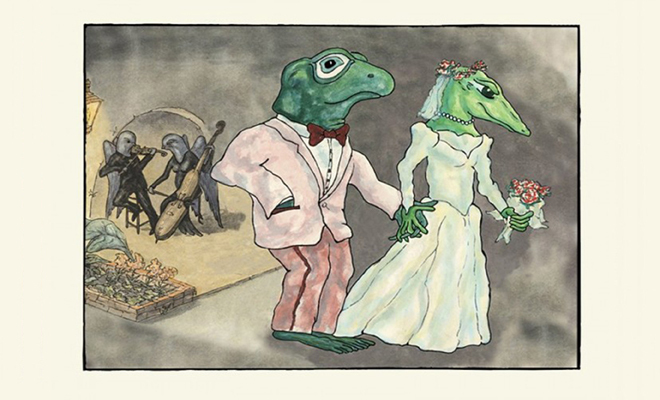 But it is those tales in which the tragedy arises from no particular character flaw, as in “The Frog and the Lizard,” that ring the most true for the average reader—who among us has not tarried too long in one place, only to find what we’ve waited for has already fled? Some even approach the sublime: “The Young Tree and the Hurricane,” for instance, speaks of a beautiful young tree seduced by a visiting storm. In language as sensitive as it is passionate, Wonk describes how “He whirled her, swirled her, arched her, pressed her tight, / amidst a darkness, total as a cave, / except for the sporadic thunderbolt / that flickered like a light-struck jewel, / revealing a chaos of things torn loose and flying — / as though the world had risen in revolt.” With superb pacing and rhythm, and just the right metaphor for the situation, here the work shines as brightly as anything in the book. This is not to say that the collection is without its flaws, however, best expressed as a lament: as good as these fables are, the book would, paradoxically, have benefitted from fewer of them. A reduction in number—down to 25 or 30—would have allowed those which end too abruptly to be more fully developed. Likewise, the selection could have focused on the most brilliant rather than the occasionally casual construction of some poems. As deft a wordsmith as Wonk is—whose neologisms include the marvelous “rodentariat,” and whose rhymes include such felicitous pairings as “veranda” and “memoranda,” or “Apollo” and “wallow”—a number of the poems are crafted in uneven, sprawling lines, sometimes of only one or two words in total, for no apparent reason. Granted, for a book of whimsical fables, such criticism may come off as overly severe, given that for most readers problems of poetic lineation are on par with concerns that some spaghetti strands are longer than others on their plate. But for poets and lovers of poetry—undoubtedly part of Wonk’s core readership—certain poems stand out as curiously unfinished, or simply less worked in comparison to the others, and not for lack of skill. Wonk’s nimble versification at his best (“The Butterfly and the Rose” is extraordinary) suggests that all the poems could have been more polished had he wished. As they stand, we wonder why they were not.